Do you need to make accurate 90° crosscuts – you need the power miter saws to help. The handy tool cuts angle according to the exact specifications you need. The blades fixed to the device for you to fine-tune and slice until you reach the best results. The power miter saws have the stability arm and it is one of its best features you need to consider when buying one. However, you must remember the tool does not rip lumber to the width and you will want a band saw, or table saw for this to happen. Furthermore, you cannot cut full stock, but there are some tricks to help increase the cutting reach. On the other hand, there are loads of other methods to help you expand the range. 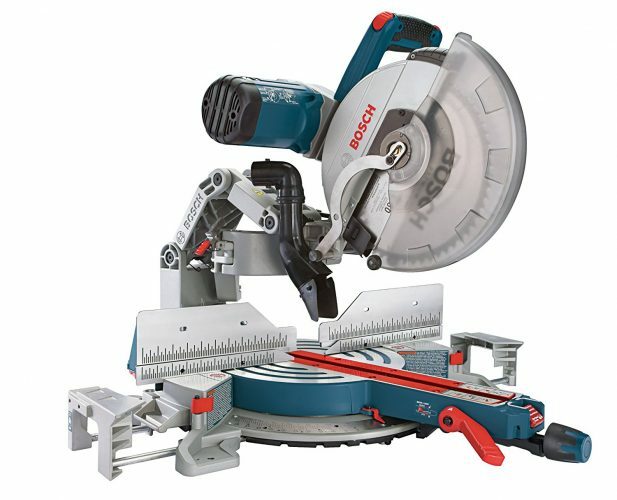 We know what a tricky task it is to find the best power tool and have selected the top 10 power miter saws in 2019 for you. We hope it helps to make your selection a little more manageable when choosing one for your DIY projects. Are you a beginner working with power tools? 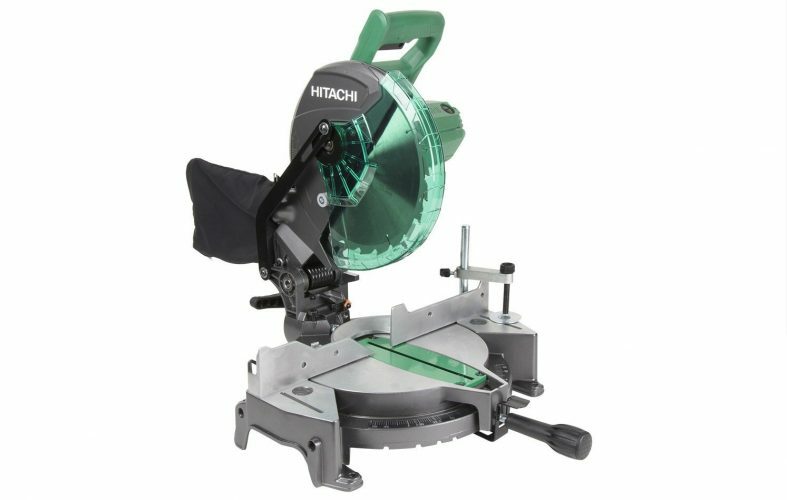 If you are the single bevel compound miter saw from Hitachi is perfect for you to use. You get up to 52-degree miter angle range to the left & right to increase flexibility. The angle range to the left is up to 45-degrees for an accurate and clean cut. There are thumb-actuated stops for quick adjustment. For maneuverability and transport the C10FCG miter saw is lightweight and weighs 24.2 lbs. For high power when cutting through material, it has a 15 amp motor. Attach it to a large table with the vice clamping system to support more extensive work projects. 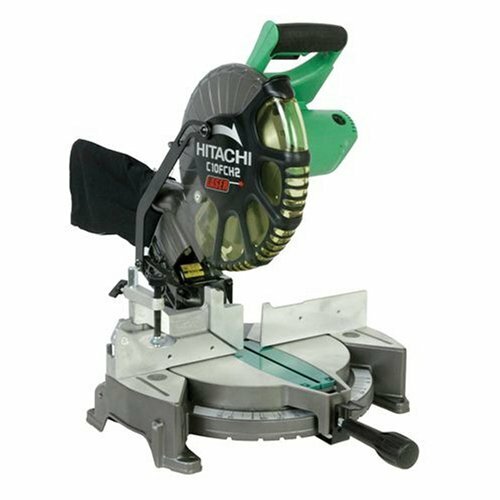 Here we have the Hitachi C10FCE2 laser miter saw, for increased cutting accuracy. The 15-amp motor is powerful to handle tough cutting jobs. The miter angle range to the right is up to 52- degrees, and to the left, it is up to 45-degrees. The flexibility for cuttings increased, and it has a left adjustable bevels top for making precision cuts. The device has a horizontal handle that is soft in hand to prevent vibration and has Elastomer grip for better control. The maximum output of the motor is 1950 watts, and it has an input of 1520 watts. The large pivoting flip fence rises to 4-inches for vertical crown cutting. The thumb-actuated positive stops help to make quick adjustments. The appliance weighs 26.5 lbs and is a 10-inch saw. You receive a 10-inch saw blade, dust bag, vise assembly, 10mm box wrench, 4mm Hex Bar wrench with material support extension included with your purchase. 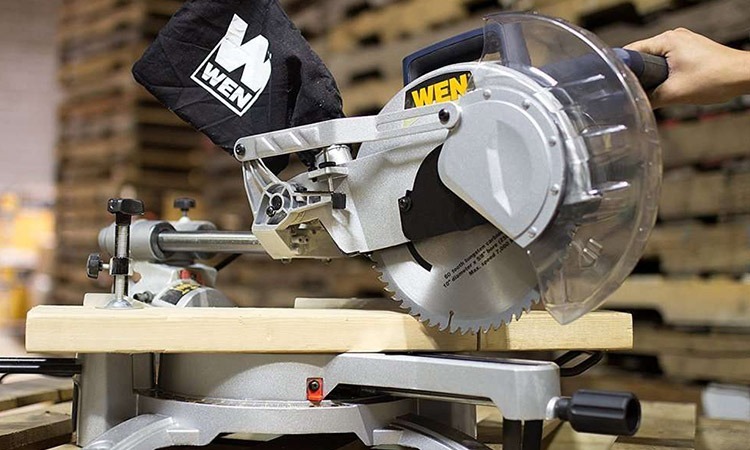 The WEN 70716 is a 10-inch sliding power Miter saw offering you versatility for cutting straight, miter, compound, and bevel cuts. You can bevel anywhere from 0 – 45° to the left and up to 52° in both directions. You can quickly tackle any sized boards up to 3.25-inches with the 15-amp motor and 5500 RPM. The tool has a spacious worktable to place boards measuring up to 11.5 inches, and you receive included a 60-tooth carbide-tipped blade. There is a dust collection bag attached, and it only weighs 30 pounds. For transporting from one place to another, it has a comfortable carry handle. The worktable comprises a fence, hold down clamp, and two support arms. Another fantastic thing is the tools backed by a two-year warranty. Another affordable power Miter Saw is the one from Delta Power Tools. 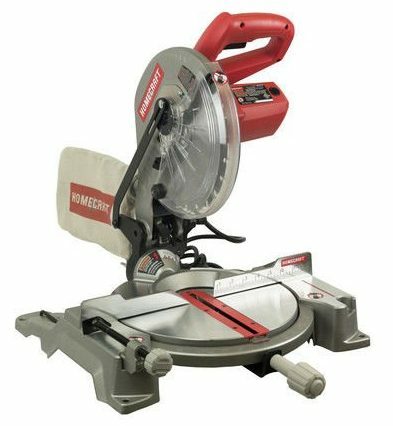 The 10-inch Homecraft H26-260L has a lightweight design and works with all miters saw stands. The handy tool has a battery-operated laser to help make aligning the blade more precise. There is a spindle lock to keep the blade in place when changing with another. For small DIY projects at home or work, the device is more than ideal to use. The motor built-in the apparatus is 14-amp, and the blade cuts at 5500 RPM. There are denoted stops at different degrees, and it is UL listed with a three-year warranty. You can use the unit to make bevel cuts up to 47-degrees. Also, you can lock out the power switch to prevent it from powering up when not used. It can cut 4 x 4 and 2 x 6 material at 90-degree and use the 2 x 6-bevel setting to cut with one pass. The handle fits comfortably in hand. 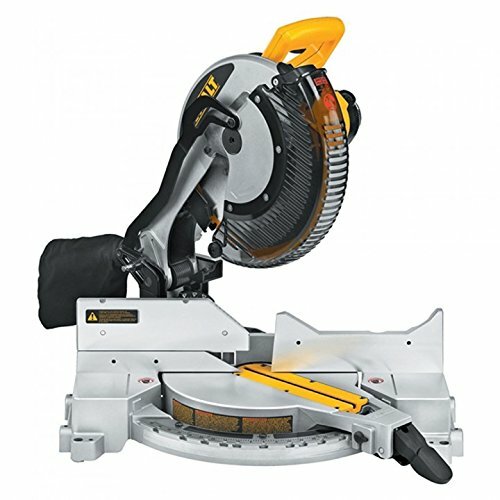 DEWALT is a well-known manufacturer that makes power tools, and you can see the same results in the DW715 Miter Saw. The device has a stainless steel miter detent plate and gives you eleven positive stops. For supporting the crown molding up to 5 ¼ -inches, it has a tall sliding fence. You get up to 48° to the left and 3° to the right for increased capacity. For perfect mite angles, you get a cam lock handle with detent override. There are four bevel stops, and it is lightweight to move around with the handle. You receive a carbide blade, dust bag, extension kit, and blade wrench included. The tools powered by a 15-amp motor with a 4000 RPM no load speed. The DEWALT has a 12-inch blade on it. You receive a three-year warranty as well. To save time and cutting precisely you need the Evolution Power Miter Saw RAGE3. The tool offers you a double bevel function saving you time, as there is no need of flipping a workpiece to make cuts on both sides. You can make repeat cuts when working with crown moldings and lessens the time to get jobs done. Three adjustable cutting depth stops are great for plunge cuts. The slide action capacity is 12.5-inches and fits the optional Miter stand. For long workpieces, it has an extendable fence guard, and you receive a 10-inch multipurpose blade included. With the blade, you can get up to 750 cuts. 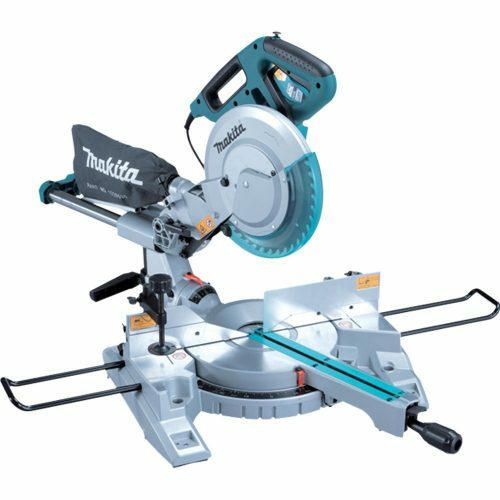 Who does not know the famous Makita brand name? Everyone knows the brand, and the LS1018 dual slide compound Miter saw comes highly recommended by many users. You can buy the tool alone or purchase it with a blade. The implement weighs 43.7 lbs and has a handle for portability. You can use it to cut baseboards and crown molding. Furthermore, it can slice 4 x 4 lumbers with one pass. The device has a 13-amp direct drive motor with a soft start. For added convenience, it has an electric brake. To the left, you get up to 47-degree miters and to the right you get up to 60-degrees with positive stops in both directions. Included you receive a 10-inch blade, triangle rule, vertical vise, dust bag, box wrench, and extension wing. The power Miter saw from Evolution Power Tools cuts hard metal with minimal sparks and needs no coolant. The EVOSAW380 has a 15-amp motor with torque gearbox. The device has a durable aluminum base that is perfect for industrial use. You receive a 14-inch mild steel cutting blade included. The instrument has a long blade life that averages 1000 cuts when cutting 2 x 2-inch mild steel. You also receive a three-year warranty with your purchase. Bosch has been around for a long time and built the best power tools for any project. 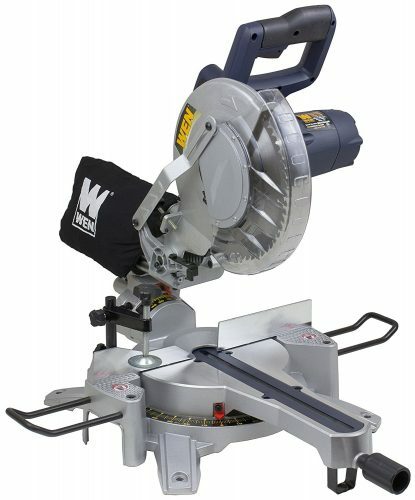 Here is the CM10GD power Miter saw with a 10-inch dual bevel and 15-amp motor. 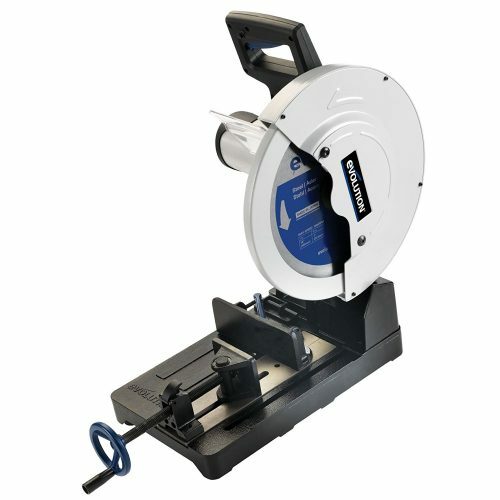 For accuracy, it has an Axial-Glide system and has an easy-to-read bevel with miter scale. You can make quick adjustments, and it collects dust in the collection chute. For ease of cleaning, it has a vacuum adapter. The head locks in place for chop cutting for upright base molding. The compact design is perfect for tight quarters and has a large trigger handle with soft grip. You get a 4800 no load rpm and offers you a 12-inch horizontal capacity with a 5 – ½ -inch vertical capacity. The crown capacity is 6-inches with a 45-degree spring. You receive a 60-tooth blade, dust bag, and material clamp included. 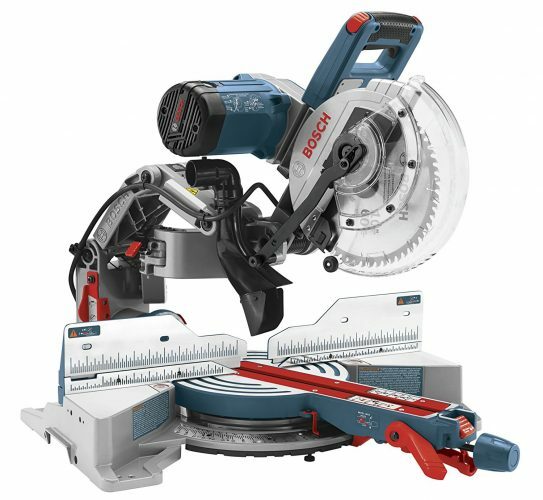 Here we have another power Miter saw from Bosch. The GCM12SD has 15-amperage with a 1-inch arbor size. The bevel angle range is up to 48-degrees in both directions. The blade diameter is 12-inches, and it has a 6-foot cord. The maximum rpm is 3800, and the weight of the tool is 65 lbs with a 120 voltage. The width of the device is 26.5-inches and offers you a 14-inch horizontal cutting capacity with a 6 – ½ -inch vertical capacity and crown capacity. You can utilize it for a variety of cuts and the bevel you can adjust and is easy to read. There is a stainless steel miter scale with roof pitch angles and marked detents. The fence has a quick release lock and aligns up to 90-degrees with a saw table. The handles comfortable in hand with the trigger to use all day and has a dust collection chute. We hope our top 10 power miter saws in 2019 help you to find the right one. You never know when you may want a miter saw for your DIY projects at home. We know the variety is vast and each one differs from another. Always consider your needs before buying one. 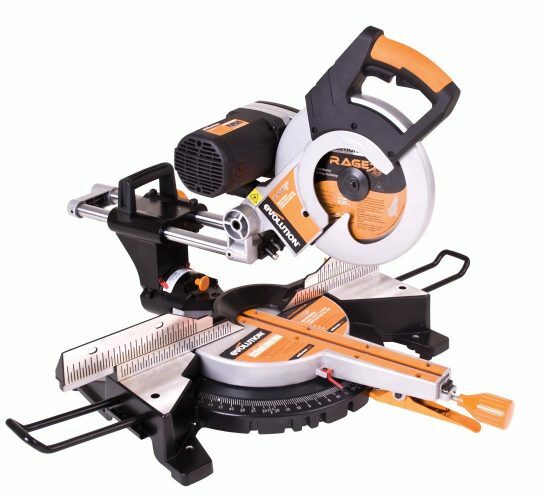 You may purchase a substandard miter saw and waste your money and can become a risk to your safety. Each one of the brands reviewed here offers you specific benefits best suited to your needs.